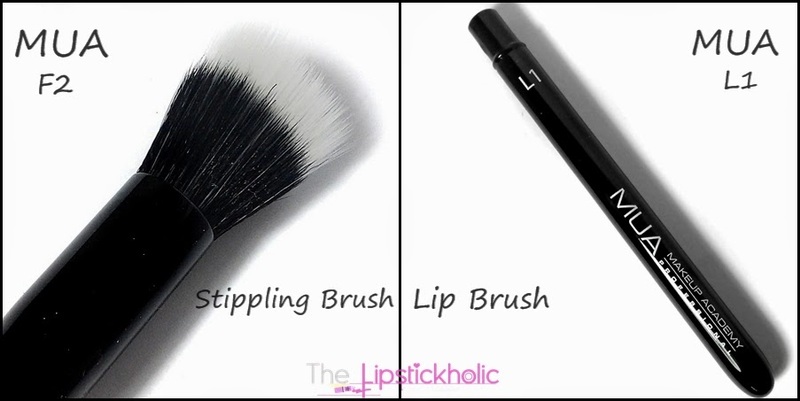 Okay so firstly we have the stippling brush or also known as duo-fiber brush. This brush is soft in texture. Like all other MUA brushes it comes in plastic packaging. It has a nice long black handle with F2 written on it. This stippling brush is made up of long synthetic bristles and shorter natural bristles. Stippling brush is used to apply foundation using stippling motion for an airbrushed look. It can also be used for applying cream blushers or highlighters. Well, I was expecting this brush to be a bit bigger or denser but this is a bit smaller than my expectation. I actually don't have any other stippling brush to compare this to. But well, being small it makes it easier to control and can be used at areas like upper lips too. But, it takes more time to apply and blend foundation on the face. 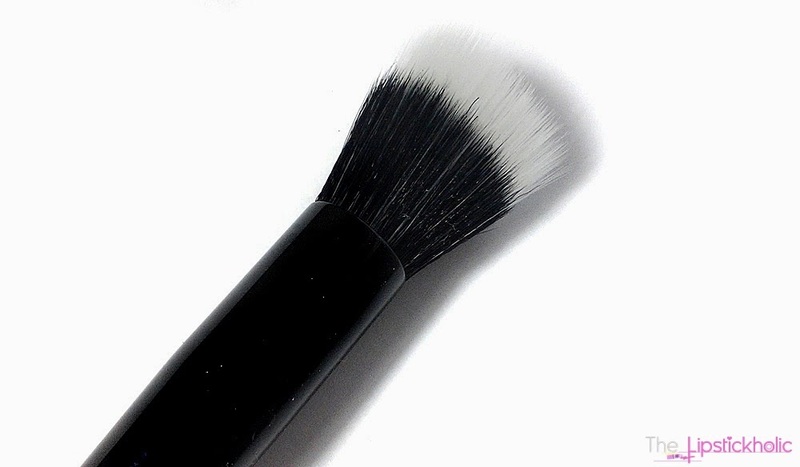 I have used it to apply foundation and it works really well as a stippling brush. It applies and blends foundation really well and gives a nice flawless finish. Again I personally feel that it's a bit smaller for foundation application and takes more time and effort. But, the finish it gives is definitely worth it. Overall I think its a great brush but I will be using it more to apply cream blushers or highlighters. I got this for Rs 350/- (discounted price) from J4G. 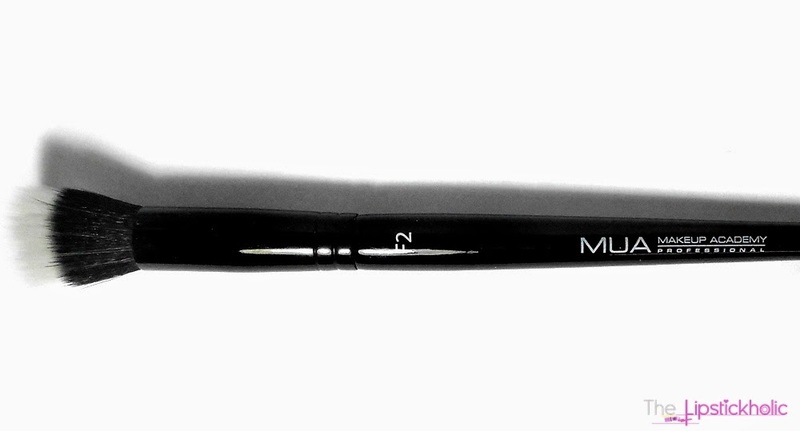 The second MUA brush that I own is L1 Lip brush. It is basically a retractable lip brush. It is made up of synthetic bristles. This brush again comes in a transparent plastic packaging but it also has its own metallic lid which I really like a lot. The lid protects the brush from dust and makes it travel friendly too. The lid can also be attached to the back of the lip brush to make the handle longer for better grip. So overall, I like the idea of creating a lip brush like this. 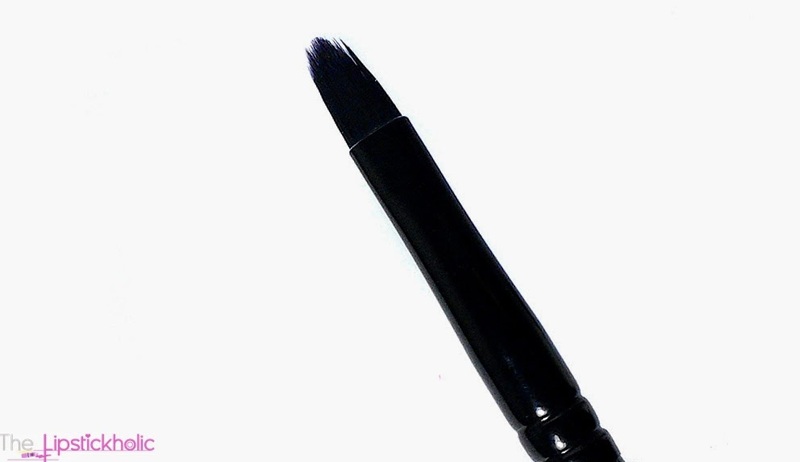 The lip brush is quite stiff and the bristles work really well for creating fine lip outline. It works really well for lip product application. I never used lip brushes to apply lipstick but this one has changed my mind. I love using this brush because it defines the lips so well and helps apply the lip product with precision. I am glad I tried this brush and I love this one. I got it for Rs 195/- (discounted price) and I think its a steal. So, both the brushes are great for the price you pay. I really like these. I have no complaints with the lip brush. However, the stippling brush is a bit smaller but it works really well and provides a great finish too. I recommend you to try these. Price & Availability: These can be purchased from MUA cosmetics website. I got mine from Just4girls. 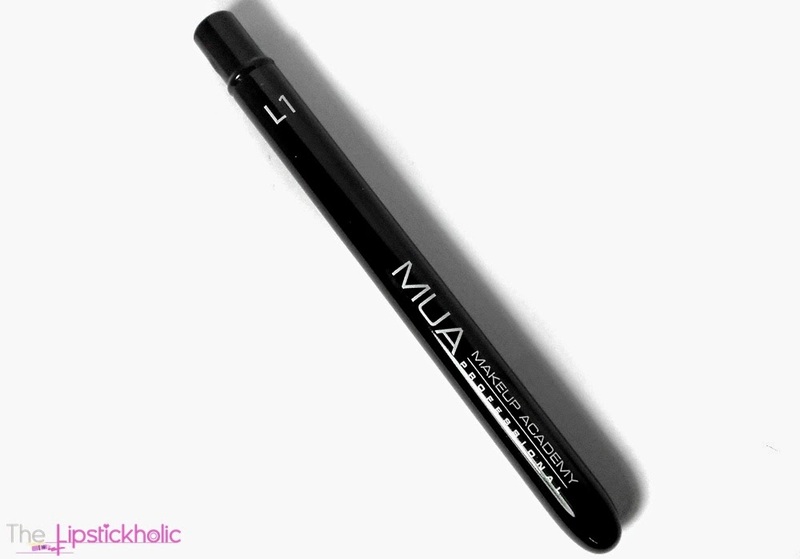 They have MUA brushes and other MUA products in stock. Have you tried any MUA brushes....??? 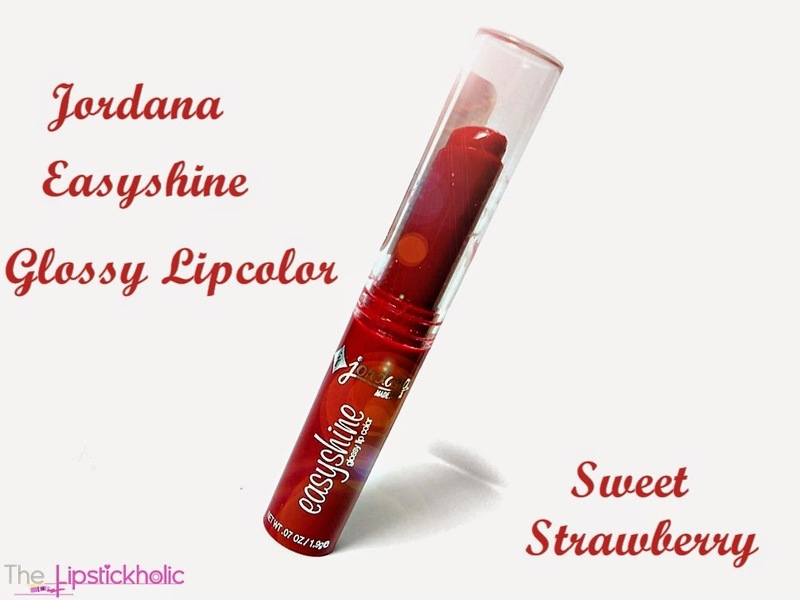 Don't forget to mention in your comments what you think about these..
Review: Jordana Easyshine Glossy Lip Color in "Sweet Strawberry"
Hope you all are doing well. I have got another Jordana lip product to share with you all. I recently tried new things from Jordana and they all were new for me and were worth reviewing. 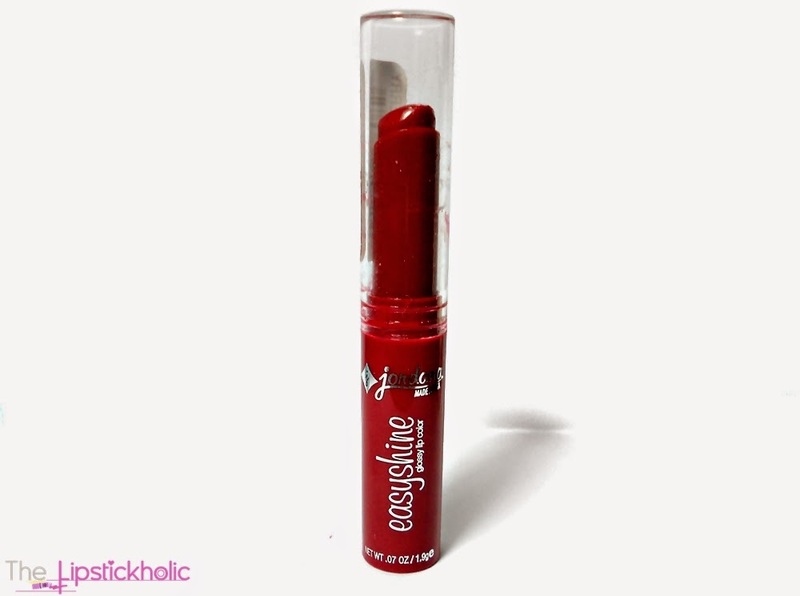 So, today am going to review Jordana Easyshine Glossy Lip Color in shade "Sweet Strawberry". Jordana Easyshine Glossy Lip Color in "Sweet Strawberry"
Okay, So I recently bought a few products from Beauty Joint which I shared with you in my last haul post. When I was going through Jordana products, this eashyshine lip color caught my attention as I like hydrating lip products and sheer lip colors. Plus, it was not expensive. Therefore, I picked one to try. 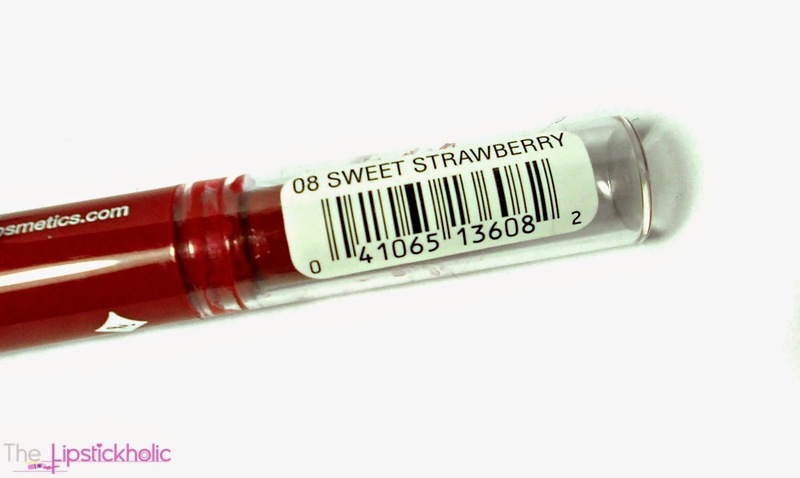 These glossy lip colors come in slim plastic twistable tubes with transparent lids. Transparent lid makes it easier to see the actual lip color inside. But, the lipstick somehow gets on the lid and it gets messy very easily. 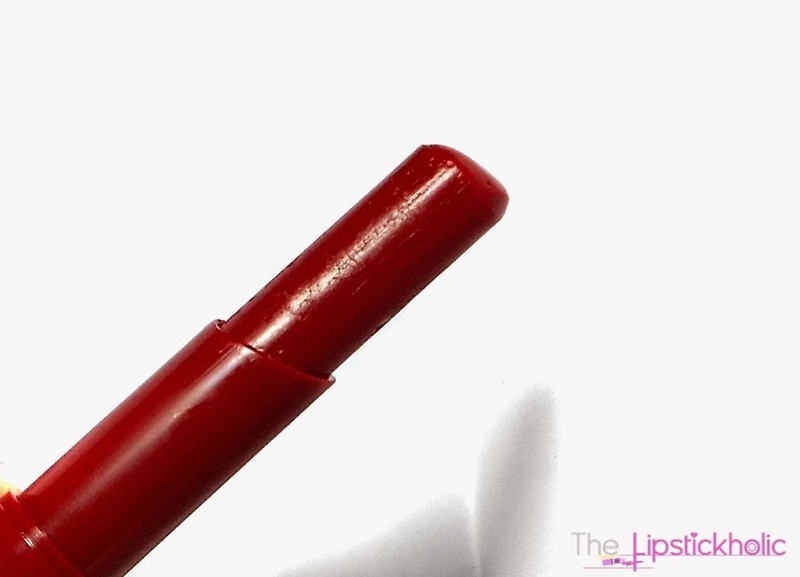 This lip color glides smoothly, in fact very smoothly on the lips and is hydrating too. I feel this one is more of a tinted balm or should I say its a cross between a lipstick, lip balm and lip gloss. It seems like somewhere between these three. The finish of this lip color is glossy as the name states. However, the glossiness disappears after about half an hour and then it turns into a beautiful natural semi matte finish which I like even more. Well this lip color doesn't feel sticky or tacky at all and doesn't dry the lips out. It feels moisturizing and feels quite natural and comfortable on the lip.It makes my lips look fuller and smoother. So, I like how it feels on the lips. The shade "sweet strawberry" is a bright strawberry red shade. It smells like strawberry too. I was expecting it to be more sheer and less pigmented. But, this shade in particular is pigmented enough with medium/sheer coverage. When swatched on arm, it appears quite sheer so I had to swipe it more than one times to see the actual color. But on my lips it appears much darker and provides enough coverage in just one swipe. The shade is actually a bit too dark for my taste and everyday use. But, I love how this product feels really comfortable on the lips. My lips were quite chapped these days because of the weather and I was not applying a balm regularly. This easyshine lip color didn't enhance any cracks on my lips but yes didn't cover them well as it provides sheer (medium) coverage. The staying power of this lip color is just average. The glossiness/sheen disappears after half an hour. But the semi matte color stays there for an extra hour. So overall, it stays on the lips for about 2 hours or so which is not impressive. But well, I like it as a sheer hydrating lip color which can be used as a balm or gloss. If you like sheer lip colors that hydrate the lips enough and you don't mind reapplication after about 2 hours, then you should definitely give it a try.